Where is the reticular formation? The reticular formation is found in the brainstem, at the center of an area of the brainstem known as the tegmentum. The tegmentum is a heterogeneous section of neural tissue that extends vertically through the brainstem, making up the portion of the brainstem that sits between the ventricles and surface structures like the basal pons and the pyramids of the medulla. As the reticular formation is found at the core of the tegmentum, it too runs along the length of the brainstem. What is the reticular formation and what does it do? The reticular formation is a very diverse structure that contains various nuclei along with numerous ascending and descending tracts. The fibers that traverse the reticular formation give the region a net-like appearance, which is where it gets its name (reticular means net-like). Due to the heterogeneity of the structure, as well as to the fact that there are not clear boundaries between the nuclei within the reticular formation, it was originally thought to lack organization. However, it is now clear that the reticular formation is highly organized, just very intricate and complex. Of the numerous cell groups and tracts found throughout the reticular formation or connected to reticular formation neurons, some worth noting are nuclei involved in neurotransmitter production, nuclei associated with the cranial nerves, descending tracts involved in modulating sensory and motor functions, and ascending tracts integral to arousal and consciousness. The reticular formation is home to several groups of cells that produce neurotransmitters; these neuronal populations have extensive connections throughout the central nervous system and are involved in the regulation of activity throughout the brain. One of the largest dopamine-producing areas in the brain, the ventral tegmental area, is located in the reticular formation, as is the locus ceruleus, which is the largest collection of noradrenergic neurons in the brain. The primary sites of serotonin release in the brain, the raphe nuclei, are found near the midline of the brainstem in the reticular formation. And, some of the largest sites of acetylcholine production in the brain, the pedunculopontine nucleus and laterodorsal tegmental nucleus, are found in the midbrain reticular formation. Neurotransmitters are produced in all of these areas and sent throughout the central nervous system to modulate sensory perception, motor activity, and behavioral responses. Reticular formation neurons also form circuits with the motor nuclei of the cranial nerves; these nuclei contain neurons that are responsible for motor movements in the face and head, as well as motor movements related to autonomic functions of the visceral organs. Reticular formation circuitry helps to coordinate the activity of neurons in these cranial nerve nuclei, and thus is involved in the regulation of simple motor behaviors. For example, reticular formation neurons in the medulla facilitate motor activity associated with the vagus nerve. This activity involves functions of the gastrointestinal system (e.g. swallowing, vomiting), respiratory functions (e.g. coughing, sneezing, breathing rhythm), and cardiovascular functions (e.g. maintenance of blood pressure). Reticular neurons in the medulla and pons also contribute to orofacial motor responses by coordinating activity in motor nuclei for the trigeminal, facial, and hypoglossal nerves. This activity, for example, allows for movements of the jaw, lips, and tongue that lead to the movements required for chewing and eating. Reticular formation neurons are also important for facilitating the operation of muscles that allow for emotional facial expressions, like laughing or crying, as well as for coordinating eye movements. The reticular formation contains long ascending (i.e. traveling to the brain) and descending (i.e. traveling from the brain to the body) tracts. The descending projections are primarily involved with the modulation of sensory and motor pathways. For example, projections extend from the raphe nuclei down to the dorsal horn of the spinal cord and can act to inhibit pain sensations. This is thought to be a major component of descending pain control systems that allow us to suppress pain in certain situations (e.g. during a traumatic event). Other descending projections from the reticular formation are involved in the control of posture and movement. These fibers are mainly found in the reticulospinal tract, which extends from the reticular formation to help maintain posture, facilitate stereotyped movements like stepping, and modulate muscle tone to either aid or inhibit movement. The reticular formation may be best known for its role in promoting arousal and consciousness. 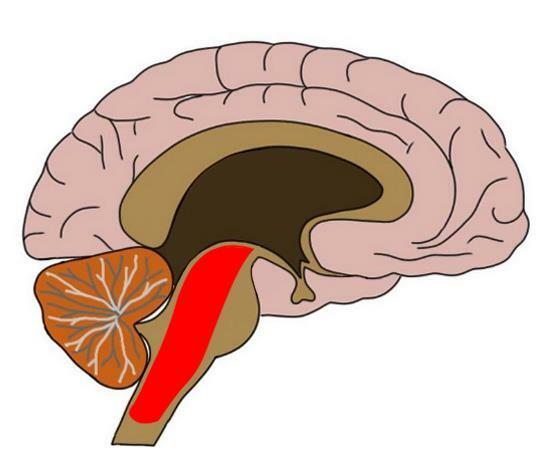 This function is mediated by the reticular activating system (RAS), also known as the ascending arousal system. The reticular activating system contains circuits that originate in several areas of the brainstem, including the midbrain reticular formation, and ascend to the cerebral cortex and thalamus. These pathways are predominantly associated with the neurotransmitters acetylcholine and norepinephrine, both of which are thought to play important roles in regulating arousal and wakefulness. The cholinergic neurons originate in the pedunculopontine nucleus and laterodorsal tegmental nuclues, while the noradrenergic neurons originate in the locus coeruleus. The fibers that arise from these locations combine with other pathways that ascend to the cerebral cortex and thalamus to promote wakefulness, vigilance, and overall arousal. These pathways from the reticular formation must be functional for normal attentional abilities and sleep-wake cycles to be preserved. Lesions to major pathways of the reticular activating system can thus impair consciousness, and severe damage can cause coma or a persistent vegetative state.